Installing a trickle charger is a must for those of us who do not use our cars daily. 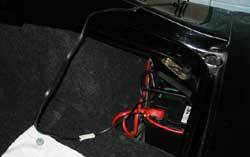 The drain of alarms, immobilizers, stereo's and a lack of use puts a real strain on the Esprit's battery. I rarely use my Esprit during the week, only taking it out at weekends, this together with a 24/7 immobilizer, stereo, CD changer and amp took it's toll on my battery. More than a few jump starts had me looking at a new battery and the idea of a trickle charger. Trickle chargers work in the same way as a normal battery charger, the major difference is the charger feeds the battery. 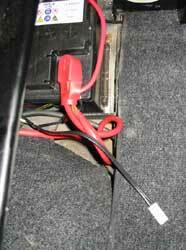 The idea is to hook your car up to a trickle charger while the car isn't in use, the charger feeds the battery with a small voltage to top up the battery and stop the drain from alarms. Such a small voltage will never recover a discharged battery (you'll need a normal battery charger), only top up one that has been used. 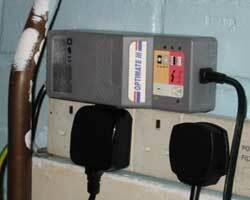 With a low voltage there is no chance of damage to your electric's, so there's no worries leaving it plugged in 24/7. 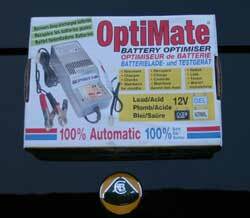 I choose the OptiMate Battery Optimiser. It comes with two connections, the first is the usual crocodile clips found on every battery charger. The second is a permanent connection to the positive and negative of your battery, this means less hassle when connecting the charger every time it goes into the garage. Optimate III has four coloured indicator lights for its chargering process. Green  Battery charged and ready to use (BATTERY OK). Red  SUSPECT condition. Yellow  Battery discharged, but charging normally (CHARGING). Orange  Battery badly discharged/slightly sulphated (RECOVERING). GREEN  The maintenance (float voltage) stage includes an automatic test for battery self-discharge, repeating during 30 minutes in each hour as long as the battery remains connected. During 30 minutes no current at all is offered to the battery, and the circuit just monitors the battery voltage for stability. If the battery voltage falls below 12,3V the red SUSPECT LED in the TEST panel will indicate a problem but the battery will then continue to be maintained in float voltage mode (13,6V) until disconnected. If the battery voltage remains greater or equal to 12,3V during the 30 minutes test the green LED will indicate and continue doing so unless a failure of a subsequent test causes the red LED to indicate. With the green LED indicating, during the other 30 minutes of each hour, the Optimate allows the battery to draw up to 200mA of current to support any connected accessories or alarms, or losses due to deteriorating vehicle wiring. ORANGE  Recovering LED will light when all correct connections are made as long as the battery voltage is above 2 Volts. If the battery is very flat (deep-discharged or sulphated) the orange LED may continue to indicate for up to 2 hours while a special high voltage (22v max) is applied to force a very small fixed current (200mA) into the battery in a recovery attempt. After 2 hours max, or, as soon as the battery can accept the normal charging programme, (which for most batteries will occur immediately on connection) the orange recovering LED will be replaced by the yellow charging LED. YELLOW  Charging stage delivers a constant current of 0,6 Amps into the battery, whose progresssively rising impedance will cause the charging voltage to increase until 14,3V, when the Optimate will start the adsorption & verification stage. The Charging voltage is now limited at 16,3V during 30 minutes. Should the monitored voltage reduce by 300mV or more, or the current drawn by the battery exceed 200mA during these 30 minutes, the programme reverts immediately to the main CHARGING stages. 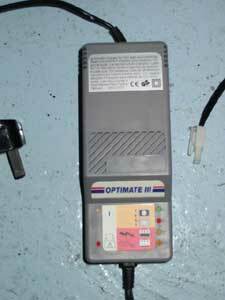 The Optimate thereby automatically ensures a full charge before starting the maintenance stages. RED  the red LED means that after being charged the battery's voltage is not being sustained or that despite recovery attempts the battery was irrecoverable. This may be due to a defect in the battery inself or loss of current through deteriorating wiring or a degraded switch or contact. It is important to note that even if the red LED does indicate, the battery will continue to receive float charge support at 13,6V until disconnected, so as to protect it from deterioration as far as feasible. Connected to the Optimate, I close the boot on one side leaving space for the wires while the cars in the garage. Plugged in and charging, making sure the Esprit is fully topped up come the weekend. See here for a neater install of a Battery Conditioner on a V8. The same thing could be done with the Optimate charger to make everything a little neater.